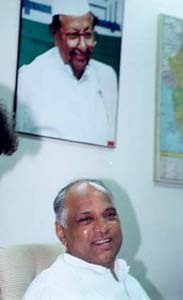 They call Sharadrao Govindrao Pawar the Strongman of Maharashtra -- perhaps because ever since he, at age 38, usurped the chief ministership of the state from Vasantdada Patil, Pawar and power, at least in the state, have been pretty much synonymous. Lately, they have also begun calling him the Straw Man. Perhaps because increasingly, the veteran leader has made bids for the big time, only to withdraw at the last minute. Thus, he made a strong pitch for the post of Congress president, post-Narasimha Rao. And at the 11th hour, made polite noises indicating his "whole-hearted support" for Sitaram Kesri. Again, when the Deve Gowda government was poised to fall, Pawar made noises indicative of an intention to split the Congress and support Deve Gowda. Again, he soft-pedalled at the very last minute. All bluff and bluster, is the impression incidents like this have left. Whatever. As he sits in the front seat of his Pajero, angled sideways so he can chat with former Union minister Girija Vyas and with Prem Panicker in the back seat, Pawar comes across as a very relaxed man, one at ease with himself and his world. In fact, the air of calm assurance -- coupled with the enormous energy -- that has characterised him during the campaign phase of the ongoing general election occasions comment from close friend Dr Ravi Bapat of the KEM Hospital, who is for the moment part of the Pawar entourage. "Strangely, he has shown no sign of his knee problem, his blood pressure is normal though, given the frantic pace of his campaign I would have expected some fluctuation, he hasn't needed medication throughout this campaign," says the doctor, in a tone of wonder. Panicker asked Pawar about this, as they drove from his home in Baramati to Sopa, a hamlet about 40 kms away, for the first of three election meetings he will address on the final day of campaigning, in his home constituency. "Yes, I am feeling very good, physically. It must be because when things are going well for you, you don't generally feel ill -- and things are going very well for the Congress just now," he says. On the morning of the 26th, Panicker and Pawar drove around for about four-and-a- half hours. First to Sopa, where he addresses a crowd of around 5,000. From there to Indapur -- enemy territory, represented in the state assembly by Harshvardhan Patil, a minister in the Manohar Joshi government. From there, to Vidya Pratishtan, one of the several educational institutions he has founded in his constituency. There, he takes his entourage on a tour of the museum -- a superbly constructed structure housing every memorabilia he has ever received during his years of public life. Plus his personal collection of over three thousand pens -- "The only thing I spend money on are pens and books," he says -- and inkpots, including a very nifty Korean one featuring a village belle actually drawing ink from a well with a bucket. 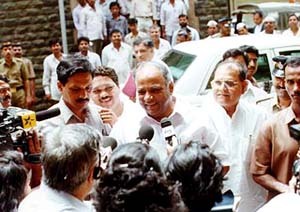 Along the drive, Pawar discusses a wide range of issues concering the ongoing polls. As campaigning across the country comes to an end, what is your overall impression of the way things have gone? The impression I get is that the Congress is poised to surprise many of you media people. I get the feeling that the party will do much better than people anticipate -- it will certainly form the next government at the Centre. And as far as Maharashtra is concerned, I think we are poised to win around 28, 30 seats -- double what we won in the last election. That is a pretty dramatic assessment -- to what do you attribute your party's improved prospects in the state? Firstly, there is the anti-incumbency factor. The Shiv Sena-BJP government has made itself thoroughly unpopular during its tenure. There is widespread lawlessness. Worse, the government and the police are seen to be actively involved with the underworld. The government has not managed to fulfill even one of its pre-poll promises. Rather, it has disappointed the very sections that voted for it the last time -- the youth, for instance. The BJP-Sena government promised jobs for 2.7 million youth, it brought down Michael Jackson for a fund-raising concert and what happened? At the end of it all, the Sena actually claimed that it had incurred losses in holding the concert! People are not fools, and that is something this government will realise soon. Besides, Balasaheb Thackeray has increasingly become a liability, not an asset, for the party and for the government. Could you elaborate on that last? Thackeray is a peculiar kind of character. If he is your friend, it is a one way thing. He believes he has every right to insult you, whether in public or private. But if you attack him or say anything against him, he goes crazy, he says stupid things, and increasingly, his sayings are proving to be an embarrassment for his party. Take the case of Suresh Kalmadi -- Thackeray calls for a press conference to announce his support for Suresh, and in full view of the television cameras, he calls him a "frog", he describes him as a "beggar in a Mercedes Benz"! That alone is enough to ensure that Suresh loses in Pune. His trouble is he says whatever comes into his head at the time -- it is his party and the coalition government that is having to face the consequences. At your Bombay meeting, you called him a coward... in fact, you appear to be attacking him a lot more openly now than in the past... any particular reason? No, why, every election campaign, in the state, we attack Thackeray because he is the Shiv Sena. As for calling him a coward, that is because he is one. He talks tough, but only when he is sure he is on familiar, friendly grounds. Not threatened, actually. What happened was I became chief minister, took over from Sudhakarrao (Naik) on March 6, and the bomb blasts were on March 12. The ISI wanted to instigate another riot, since the blasts were set off by Muslims, they thought there would be a backlash by the Hindus. The last thing I wanted was another riot in Bombay, it would have sent out wrong signals to the international investing community, so among other things, I did call up Thackeray and told him that if he started something, instigated people to riot, I would put him in jail. Sonia Gandhi is definitely responsible, to a great extent, to the resurgence of the party's fortunes, there is no doubt about that. What has been her real contribution? She has set the agenda for this election. More importantly, she has got the BJP on the run -- Advani and Vajpayee are reduced to running around after her, defending the party against her attacks. Earlier, it was the BJP that set the pace -- once Sonia Gandhi entered the fray, it is the Congress that is taking the lead, while the BJP is desperately trying to catch up. I must say it was a brave decision on her part to come out in the open and campaign -- her life is in constant danger, especially after the Jain Commission report and the verdict against the LTTE in the Rajiv Gandhi case, but she has not shied away from going to any venue, no matter what the risk, that is very creditable. Besides, she is being seen as a second Indira Gandhi by the poor. Now this is one constituency that deserted the Congress, because the poor of the country thought that the party, in the post-Indira Gandhi face, no longer cared for them. I had picked up 20 boys and girls, students of politics in various colleges, and had them monitor the first five meetings Sonia addressed, I asked them to mingle with the audience, get feedback, then we sat down and analysed it. And one major factor we discovered, which frankly came as a surprise to me, was that the poor were her strongest supporters, they think that in her, they have once more found a Congress leader who cares for them. Is that not an indictment of your party, as being anti-poor? Not really. Let me explain what actually happened. When the Congress under Narasimha Rao opted for liberalisation, it made one big mistake -- it did not educate the people, across the country, about the true meaning and implications of the reforms. Take China -- it embarked on a liberalisation drive in the late seventies, much before we did. But the government took care to teach people the implications. I have been to China, I noticed that wherever you went, you could ask an ordinary citizen and he would explain, in detail, about free markets, and all the other jargon of liberalisation. Our people, however, have not been properly educated about liberalisation -- with the result that it is easy for our political opponents to paint a picture that liberalisation is only for the rich, that it means Coca-Cola and Bisleri for the elite while the poor do not even have drinking water. And it is this that has caused the poor to drift away from the party. Okay, those are the plus points for Sonia. How about the negatives? Her Italian origin, for instance? Actually, that is proving -- again, to my surprise -- to be our strongest plus. One day -- I was touring outside Maharashtra at the time -- I asked a 70-year-old woman, who did not recognise me, why she had come to see a videshi, a foreigner. She actually got angry. She said, in our culture, the girl belongs to the husband's family, to the husband's place. 'If my daughter marries a foreigner and goes abroad, she is no longer Indian, she is a foreigner, and the same way, a foreigner who marries my boy becomes a part of my family, she becomes an Indian,' this old woman argued with me. You see, we Indians set much store by these things. And that is something the BJP did not take into account -- by attacking Sonia as a foreigner, the BJP is actually consolidating the women behind her. It is a bad miscalculation on the BJP's part, one of several. And people like Thackeray, who go around mimicking her and making filthy remarks, have only further alienated the women, even the men find it cheap and vulgar. That is the trouble with Thackeray, sometimes the things he does thinking it is clever actually turn out to be very stupid. This Sonia Gandhi thing should be seen in perspective -- the people of India have an emotional attachment to the family. And why not? Three of the five Congress prime ministers belong to that family. The people empathise with the family name. Besides, there is another thing -- if your father and mother are doctors, it is likely that you will study medicine too. Why? Because your father and mother can pass on their experience to you -- tell you how to make sure of getting a medical college seat, tell you what to concentrate on to get top marks, things like that. It is the same with a political family -- if you enter politics today, you will make a lot of mistakes. If my son enters politics, I will be able to guide him, he too would have learnt a lot from watching me, so he is less likely to make mistakes. So don't forget that Sonia Gandhi has watched not one, but two prime ministers at close quarters, she has obviously learnt a lot from them... so I don't see any harm at all in her coming into active politics. So you see only pluses, no minuses, from the presence of Sonia Gandhi at the head of the Congress campaign. So was this part of a deliberate strategy? Did you know, at the time of the fall of the Gujral government, that Sonia would campaign for the party? And is her style of campaigning -- which the media is now dubbing as shoot and scoot -- part of a carefully orchestrated strategy by the party think tank? I would say no, to both. When the Congress decided to withdraw support from the Gujral government, we had no real idea that Sonia would enter the campaign. And when she finally agreed to take part, our concern was to try and have her address as many meetings, in as many different constituencies, as possible. To achieve this, it was necessary for her programme managers to fix it so that she would fly into one place, address a meeting, and fly out at once, preparing for the next trip. So no, it was not carefully thought out strategy, it just happened that way. What next? Sonia for PM? The CPP leader will be elected only after the results are all in and we have met. At this point, we have not even begun discussions on the subject. Yes, Vajpayee and Advani are very clever speakers, but that does not mean everything they say is true. For instance, when Rajiv Gandhi died, who was our prime ministerial candidate? You see, almost all the time, the Congress has been in government, so it was a prime minister who led the party to the polls. And in two instances -- first after the Emergency defeat, then after the fall of the V P Singh and Chandra Shekhar governments, the party presidents were former prime ministers -- so it was obvious that we would fight the election with them in the forefront. All this business of "who is the Congress party's prime minister?" is only clever speech-making. If it comes to that, since Vajpayee is sure he will become prime minister, his party is already making arrangements for his Raj Tilak, why is he worrying so much about who our prime ministerial candidate will be? When discussing the reasons for your party's upbeat mood in the state, you said something about it being united, unlike the last time. Could you explain that a bit? Sorry, could you elaborate on that a bit, please? The last time the party contested an election in the state, there was dissidence within the party. Now dissidence is a funny thing -- the central leadership can create it when it wants to, and end it when it wants to. Last time, the central leadership wanted to create dissidence. So what happened was that for every Congress candidate, there was at least one rebel -- and if you look at the results, you will see that not only did a lot of the rebels win, but if you tally the rebel votes and Congress votes polled the last time, we should have won about 30 seats if we had been united. This time, six months before the elections were announced I was already engaged in meetings across the state, I was meeting all the leaders, unit chiefs, everybody, sorting out problems, ensuring that there would be no grounds for dissent. So this time, we are fighting the election as a united party, and that is the reason why I am sure we are going to do very well, reverse the verdict of last time.